Two of my favorite companies teamed up during October to cross promote their products. It’s been amazing to discover how well their products work together. I’m talking about Art Glitter and Globecraft Memories. And, it just so happens I’m on each of their design teams so how much fun is that! For this cross-promotion I almost made another ornament. I love how quick and easy they are to make and they just mesmerize me. I love the way the light shines through the glitter shards. But, I decided to put some extra effort into it and try my hand at another Globecraft Memories Easel Greetings. There’s really nothing fancy about these greetings. They come five to a pack for under $5 and they’re white. That’s pretty much what I like about them. They’re plain so I can paint, spritz, ink or cover with pretty paper, they stand on their own, so my recipient can put it on display, and they fit into a standard-size A2 envelope (unless you get a little heavy-handed like I tend to do!). On this Easel Greetings I actually incorporated Xyron as well. I ran my corrugated heart (yes, I used it again) through the Xyron 2.5″ Create-a-Sticker and rubbed away part of the adhesive before coating it in Art Glitter and tapping the excess off. Remember the faux lace technique from May? Well, rather than use a tape runner I discovered the technique works just as well with the Xyron. It gives it a roughed-up appearance which I tend to like. That adorable birdcage on the card front is also from Globecraft Memories. It’s from the Piccolo Vintage Bird Cage Charms. 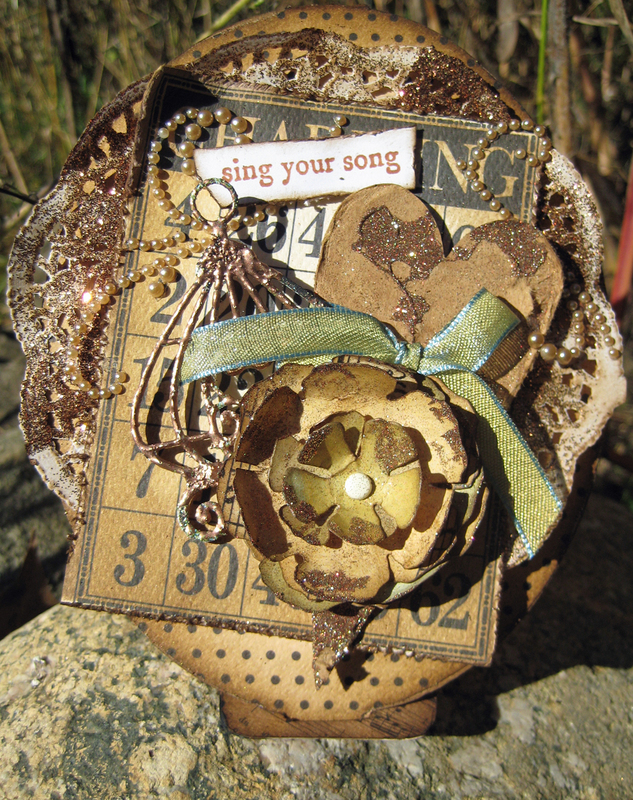 Hop on over to Art Glitter’s blog and you’ll see the steps involved to make this card yourself. While you’re there, check out the posts from the rest of the team. There are some adorable and creative projects! No one has more fun than you do creating beautiful projects, Linda! This is just gorgeous. Thank you, Linda! I do have fun! Love it when all the stars line up this way… what a gorgeous creation you’ve made showcasing a number of different products. Love all your layering and that stacked flower, especially!